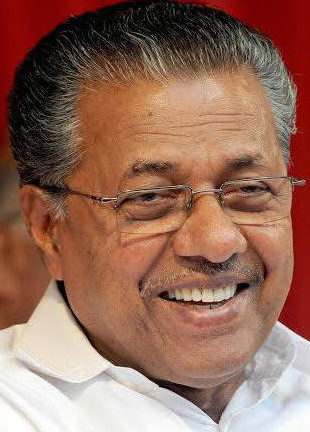 Pinarayi Vijayan entered politics through student union activities at Govt Brennen College, Thalassery and eventually joined the Communist Party in 1964. During the emergency period (1975-77), he was arrested and tortured by the police. He is a member of the Polit Bureau of the Communist Party of India (Marxist). Earlier he had served as Secretary of the Kerala State Committee of the CPI (M) from 1998 to 2015. He also served in the Left Democratic Front Government under Shri. E.K.Nayanar as Minister for Power and Co-operation from 1996 to 1998. During his stint as Electricity Minister, the state achieved a record enhancement of power generation capacity through timely execution of augmentation and new projects. He is married to Kamala and has two children, Veena and Vivek. He was elected to the Kerala Assembly in 1970, 1977 and 1991 from Koothuparamba constituency and in 1996 from Payyannur constituency.